Rev. Chad Brooks, pastor of Foundry United Methodist Church in Sterlington, traveled to Walker, La. on Nov. 16 to preach at Faith Crossing UMC's Friendship Campus, and to take receipt of a 14-foot covered trailer that Faith Crossing is donating to Foundry. Rev. 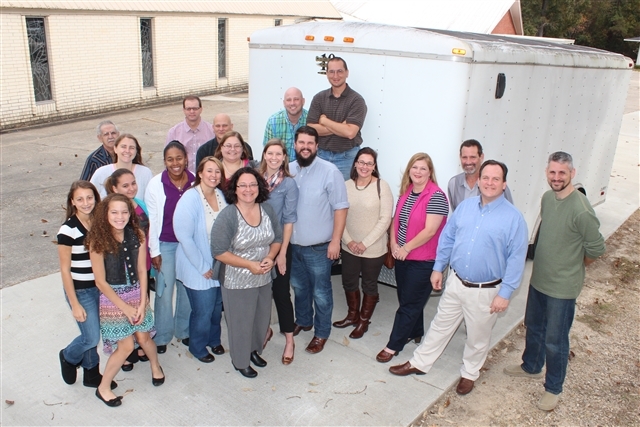 Warren Clifton, pastor of Faith Crossing UMC, said the people of his church were happy to donate the trailer and other equipment after receiving so much prayerful support when Faith Crossing was launched seven years ago. “This is really a small contribution compared to the many ways the Louisiana Conference and our friends and fellow Christians in the Greater Baton Rouge area, and all across the state, have prayed for us and sustained us as we’ve grown through the years,” Clifton said, pictured second from the right. Rev. Brooks is pictured in the center of the photo.